I loved Jace Faraday with all my heart. I loved everything about him, from his huge smile to his fabulous laugh. Another man never caught my eye. It was always Jace and Shay, together forever. He devastated me, he ruined me. I’ve never gotten over it. But, I’m a survivor. I’m not a precious flower that can only thrive if kept safe from the perils of the outside world. Except now Jace has returned home. He’s just across the street from me, so close I swear I can actually feel his presence. I can’t avoid him forever. At some point I have to face him. And when I do, I know sparks will fly. To redeem himself for his past actions, I need major remorse. I need a profuse apology and maybe even a little begging for forgiveness. I won’t settle for anything less. However, when the truth behind our break-up is revealed, I’m stunned. It leaves me reeling—and yearning for the six years that have been lost to us. The thing is, once the truth is known, there’s nothing to keep us apart. I can't even begin to tell you how much I love this series. Getting to this last book in the series is bitter sweet. Bitter to think I'm at the end but ever so sweet to read Shay's story. The people in these books have become familiar to me. I feel that I'm a part of them and that is exactly what I look for as a reader- a real connection to the characters, real emotion. You cannot have a heart and not feel something reading these books. Jace and Shay have a history. A very powerful, love-filled history. Then things changed and life moved on. But now? Jace is back home and Shay is filled with mixed emotions while Jace seems to be on the pursuit. I found this whole book terribly romantic. I love second chance at first love stories and this one just might be one of my favorites. My heart was so filled with emotions! I was confused, frustrated, hopeful and my tummy was filled with butterflies as Jace and Shay reconnect and reconcile. Yup, it's love from me for this book. Lots and lots of love. If you haven't started this series yet, now is a good time. The first book, Stone Silence is FREE on Amazon starting today. It was my favorite of the whole series, even though I loved all three. 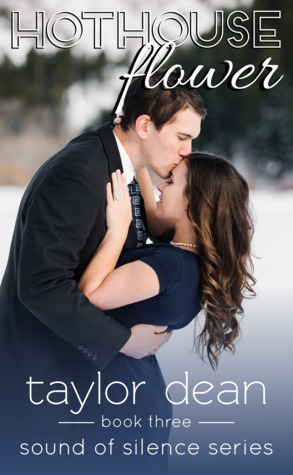 AND if you haven't ever read anything by Taylor Dean, you REALLY need to. I promise you won't regret it. Content: This book deals with a very sensitive issue and there are some details explained, after the fact, regarding it that may be tough for some readers. Kissing. - I received a complimentary copy of this book from the author. All opinions expressed are my own. Thanks for an amazing, wonderful, and fantastic review that makes my heart swell as I read it!!! Love you, Aimee! I am so thrilled that you loved the entire series! Romance is in the Air $100 Kick Off Giveaway!